I am asking for help to locate the person who put in a pix of the hexie flowers made in different colors. I've tried to locate it by date but have been unsuccessful. I printed the pix & it has the date July 7 on it. I want to ask her about her fabrics but cannot find her name. Can anybody help? Thanks so much. Might be easier to find the original poster if you post her picture here. Was it the one of the Hexie flowers with the centers pieced in different designs? I think pink/white and black but I don't remember the title, sorry. I know it would but I still can't seem to get pix posted yet. Since it's on a pc. of copy paper I really wouldn't know how to do it. This system has me snookered. Each hexie flower was a diff. color but from the same fabric line. The centers (look like roses) appear to have been fussy cut from the same fabric. http://www.quiltingboard.com/main-f1...l-t226837.html I think this might be the post you are looking for, It's called Sew beautiful... in pictures. Last edited by QuiltE; 08-07-2013 at 07:48 PM. That is exactly it. Thank you so much. Now the mystery will be to find that fabric line. There is another post after this about them. I'll go ck it. This is just what I was looking for. I hope somebody can tell me know the name of the fabric line. Looks pretty scrappy to me. I recognize the lighter green fabric in the leaf on the upper left, it is a fairly old print, 4 or 5 years I believe. When I see a picture I like I click Pin It. Save it to my Pinterest album. Two clicks and I'm done and not taking up space on my computer. The picture will have the original post site saved. just send the quilter a PM (private message) and ask. I, too, would love to know this fabric line. Such a stunning use of hexies! Okay I pawed through my stash and found the fabric pictured in that leaf. 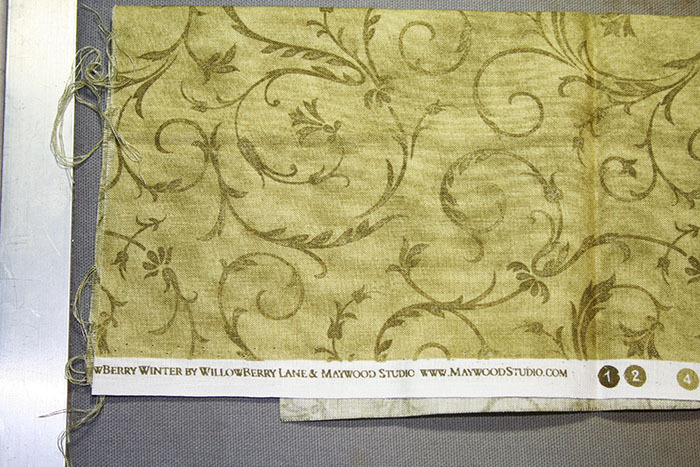 It's called Willowberry Winter by Willowberry Lane for Maywood Studio. Peckish, you rock! That's a start! Now just to find the rest! As a sidenote, this just proves one should have a stash! Just see how helpful you've been!